There is a LIGHT in each of us, Re-ignite your SPARK! >>> It' time to make changes that will make your life happy, fulfilling, and rewarding. It's time to learn how to find joy in any circumstance. It's time to break free! There is a God. In His hands we are powerful. He loves me, and everyone else. I am a messenger, He is the healer. He is the light, I am a torch. I am responsible for the life and all of the gifts He gave me. I am accountable for my life. I am a powerful creator in my own life as I follow God. Forgiveness is liberating. Change is beautiful. God can do for me what I cannot do for myself. I organize my life from my deepest beliefs and out of that comes my results. I chose to believe that God is working in life for my best good. The way I feel about what others say about me reflects my own beliefs back to me. When I am angry it is about me, not another person. A challenge is a great opportunity for growth. Everyone has a purpose for living. My intention is to show up as my whole self. When we coach together, there's something important for you to know: I will try always to focus on you. That means that when you start talking about another person I will turn the conversation back to you. We are going to work together most powerfully as we focus on the only people we can change: OURSELVES! Through the principles and practices I apply with you, I've been able to recover from abuse, low self esteem, anxiety, suicidal thoughts, and emotional divorce. I have successfully helped others to do the same. 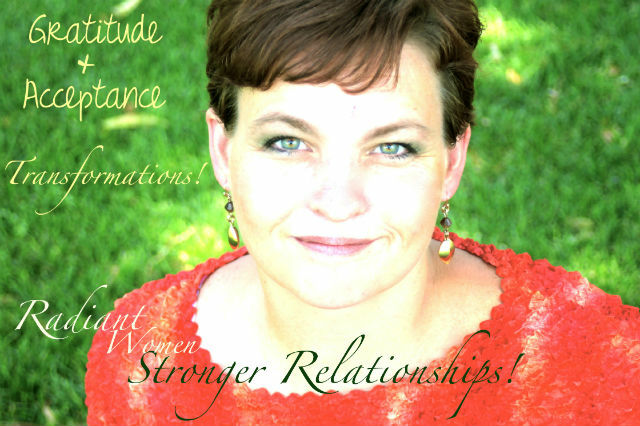 Gratitude, Forgiveness, Love, Trust, and Acceptance are some of the tools I can teach you how to reclaim and how to use. Learn how to use the tools you were born with to overcome the problems you're hampered with. The day I decided to forgive myself and others for all mistakes of the past, present, or future was one of the most liberating of my life. EVERYTHING we have experienced in life IS for our best interest and will be to our great benefit if we shed the blinders of guilt, blame, resentment, and shame. The only thing holding us back from living free and full lives is our own beliefs. I believe that whether healing comes directly through prayer or through any type of practitioner it coms from Christ. Because of Christ all of us can be free of pain, because of Christ all of us can know and fulfill the purpose for our being, because of Christ ALL our wounds can heal. I’d like to help you clear out the “something” in your way, and help you access more of His healing, light, and guidance.